Wall Street has had its best day of the year Tuesday, storming higher after some good news from Citigroup. Citigroup Inc. says it operated at a profit during the first two months of the year. That energized financial stocks and in turn, the entire stock market. Surprised investors drove the major indexes up more than 5.5 percent to their biggest one-day rally of the year. The Dow Jones industrials shot up nearly 380 points. However, many analysts are still cautious - noting that Wall Street has seen many blips higher since the credit crisis and recession began. Word of Citi's performance broke a months-long torrent of bad news from the banking industry but analysts weren't ready to say the stock market was at a turning point and about to barrel higher after a slide that's lasted more than 16 months. "I don't think that's rally is in any way an all clear signal for the market," Michael Farr, president of Farr, Miller and Washington, told CBS News. "The economy is in very tough shape. We are really struggling with out financial and banking system. And it may go lower." The Dow jumped 379.44, or 5.8 percent, to 6,926.49. 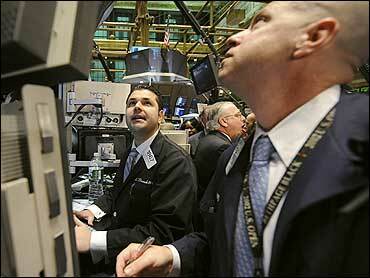 Dow stocks with the biggest gains included General Electric Co., which jumped $1.46, or 19.7 percent, to $8.87. GE has a big financial services division, so it tends to move with banking stocks. While the markets rallied, the recession claimed more casualties, reports CBS News Business Correspondent Anthony Mason. United Technologies, which makes everything from Pratt & Whitney jet engines to Otis elevators, announced 11,600 job cuts. And Moody's reported the number of companies at risk of defaulting on their debt has nearly doubled from 157 to 283 over the past year, and now includes MGM Mirage, Cooper Tire & Rubber and Eastman Kodak. Federal Reserve Chairman Ben Bernanke acknowledged the recession is far more severe than the Fed anticipated. "My forecasting record on this recession is about the same as the win-loss record of the Washington Nationals," Bernanke said today. Baseball's hapless Nationals won 59 and lost 102 last year. Bernanke also called for a revamping of the country's financial system, Mason reports. Citigroup's stock soared 38 percent. Buts it's still only $1.45. In a letter to employees Monday, Citi Chief Executive Vikram Pandit said the performance this year has been the bank's best since the third quarter of 2007 - the last time it booked a profit for a full quarter. Based on historical revenue and expense rates, Citi's projected earnings before taxes and one-time charges would be about $8.3 billion for the full quarter. A bear market is defined as a drop of 20 percent from a market peak - and stocks passed that point last year and continued to plunge, leaving the Dow and Standard & Poor's 500 at less than half the record highs they reached in October 2007. A bear market rally lifts stocks off their lows, but it quickly evaporates. Reports surfaced Tuesday that federal regulators are considering a proposal to reinstate the uptick rule, which backers say helps protect companies from excessive shorting. It was allowed to expire in 2007.